Pizza 16 is sad while Katz is back. 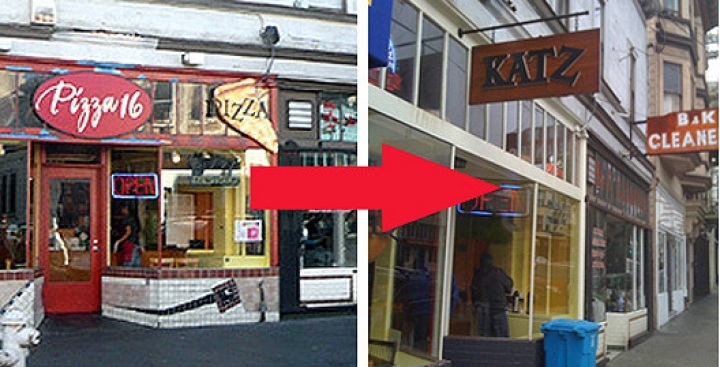 The Mission: The bad news is that the giant UFO sign-thing that gave an otherwise nondescript bagel/pizza shop its personality is still very much absent, but the saving grace, for now, is that Katz has put a stop to the bland "Pizza 16" experiment. Above, a passerby captures the return of Katz to 16th Street. After the December name switch and ownership change—not to mention quality nosedive—angered many locals, will the Katz faithful return now that the name is back?